Sometimes you just can’t persuade your mates that they should join you on your dream ski or snowboard trip – and that’s when you just have to bite the bullet and go it alone! Here are our top tips and trips for solo ski and snowboard travellers. 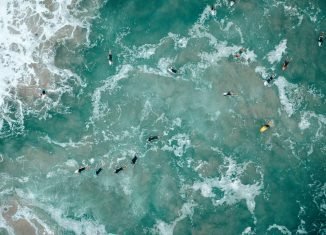 Ski and snowboard travel has never been easier, and the media constantly bombards us with exciting new destinations and adventures all over the world. We all have ever-growing bucket lists of places we’d like to visit, couloirs we want to shred, powder we want to ride, and peaks we want to climb. The problem with such variety is deciding where to go each season becomes increasingly harder. We all have our own aspirations and goals, which often don’t match up with our friends, family and usual ski/board partners. 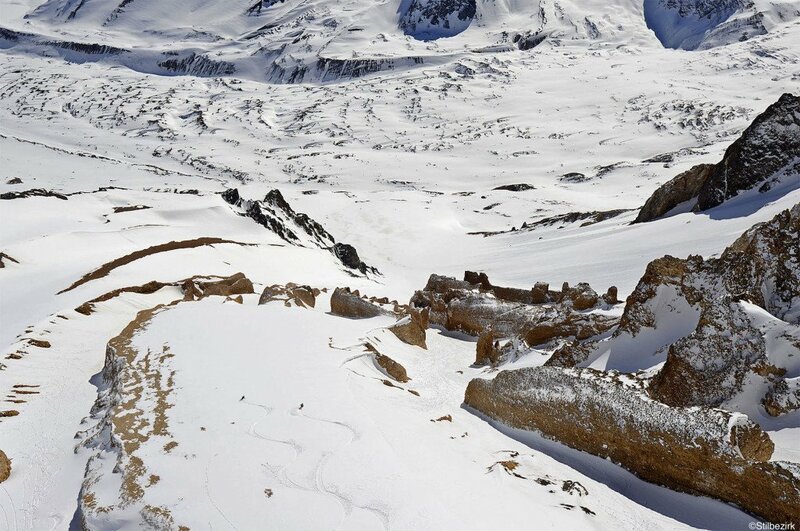 Perhaps you want to go heliskiing in the Himalayas, while your friends just want to go back to France. Maybe you want to ski Japan’s legendary powder, but your family aren’t up to freeriding and want to go somewhere with lots of sunny piste skiing. 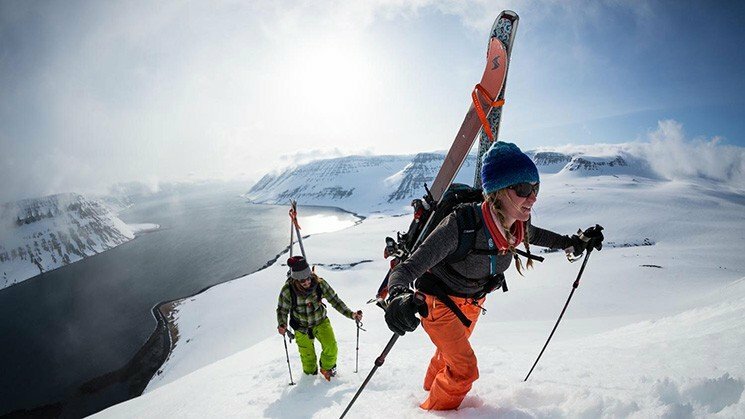 Or maybe you want to climb and ski couloirs to the sea in Norway’s Lofoten, but your mates flatly refuse to walk uphill when there are perfectly good chairlifts in the Alps. What if you’ve been planning and saving for that dream Alaska heliski trip, but you don’t know anyone with the ability or bank balance to join you? Contemplating a South America trip, but everyone you know thinks summer is for beach holidays? Sometimes you just have to bite the bullet and accept that if you really REALLY want to go somewhere, you might have to do it alone. I’ve been there too: after years of watching dreamy Japan videos, in 2014 I finally decided that I’d waited long enough and HAD to go there ASAP. I’d been saving some money for a big trip, but none of my friends had, so in January I jetted off to Hokkaido for a month by myself. It’s still one of the best trips I’ve ever done, particularly as with only myself to please, I could do it just the way I wanted to. I wouldn’t change a single thing about that trip. Solo skiing is a controversial topic. Some love it; some hate it. Being alone in the mountains and relying on no one but yourself to stay safe is an incredible experience – the solitude, and the humbling experience of being a very small thing amongst such huge chunks of rock and ice can really deeply affect how you think and act. However it’s one thing going out alone in your familiar home mountains, where you intimately know the terrain, snowpack, and emergency rescue procedures, and quite another to throw yourself in at the deep somewhere halfway around the world. Aside from the safety concerns, sometimes things are just more fun with friends! Friendly banter helps deal with any nerves before dropping in, and a powder day is infinitely better if you can celebrate it with a few gloating beers in the bar with your buddies after! 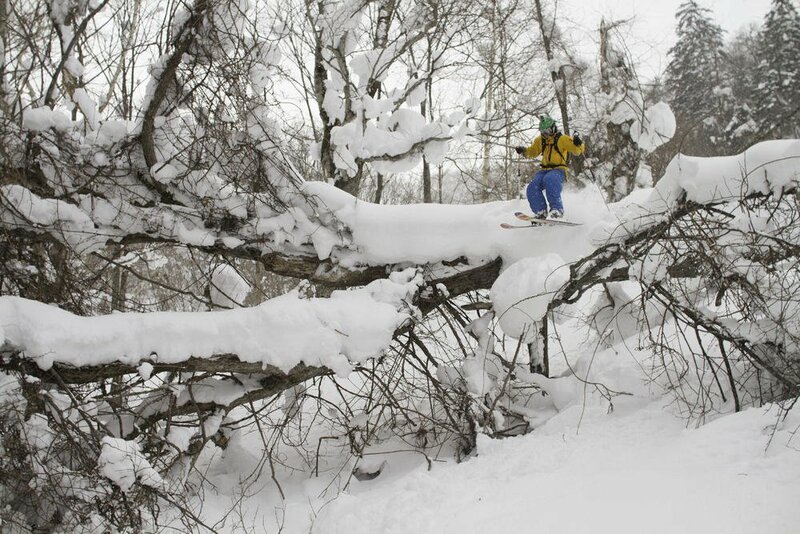 Plus, if you’re alone, who’s going to take that rad powder photo of you for your new Facebook profile pic? Accommodation is one of the harder aspects of solo trips: many establishments charge extra supplements for single room occupancy. However, where you stay is your single biggest opportunity to meet new people to ride with, so it’s more important to find the right place than try to save money and end up isolated in the middle of nowhere. 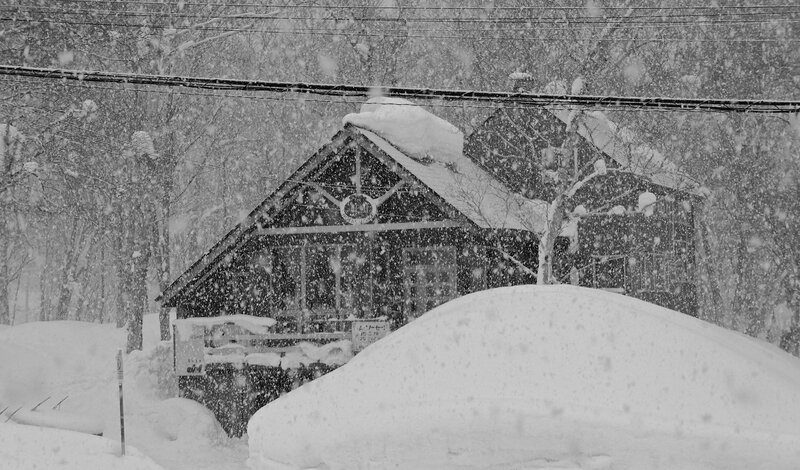 Lodges like Black Diamond Lodge in Japan are the ideal set up. 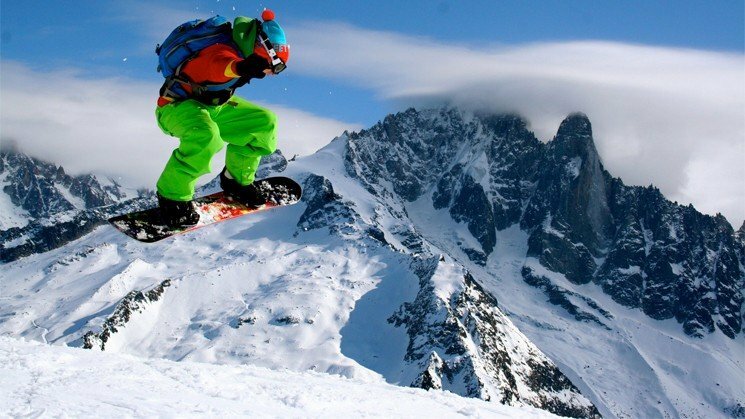 It’s well known and popular within the more dedicated freeride ski and snowboard circles, so the vast majority of people who stay there are there to ride powder above all else, usually to a high standard; everyone there has a diehard love of snow in common, and it’s easy to find solid partners to ski with each day. The mix of private rooms and dormitory-style bunk rooms mean you can choose between the extra privacy, or avoid the single supplements and make the most of the social side in the dorms. The onsite bar and big group breakfast provide further opportunities to socialise and meet new people to ride with. On the ground travel is the next big problem for the solo skier or boarder. On international flights it doesn’t make much difference whether you’re on your own or in a group, but transfers can get a lot more expensive once you’ve touched down! In a group you can keep taxi costs down by splitting the price between you, but you when you’re alone you’ll have to pay full whack. In some of the more exotic and far flung destinations like Kashmir this isn’t too much of an issue, as prices are generally so far below Western levels that a taxi or private transfer is still very affordable. The issue is compounded if you want to travel around a lot while on your trip, for example between different resorts or ski areas. 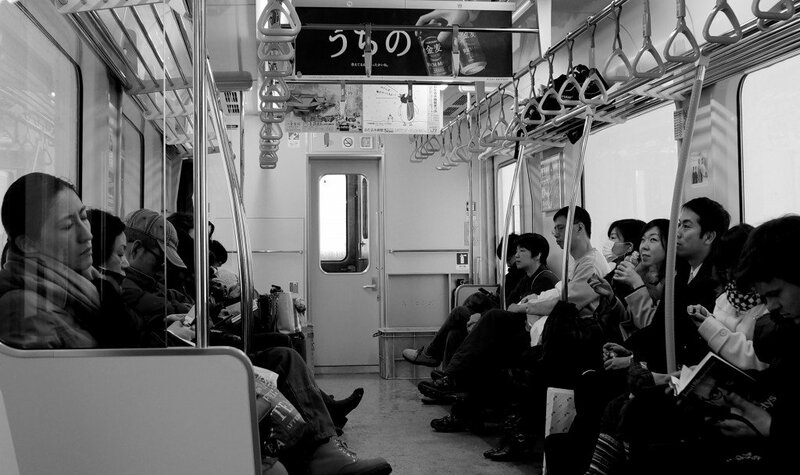 In places like Hokkaido, which is relatively compact and has an excellent and reliable rail network, it’s easy and affordable to get around on public transport as long as you plan ahead a bit and leave some wiggle room in your itinerary (signs aren’t always in English, so you want to double check that you’re getting on the right train!). In bigger or more remote areas like Norway and Canada, the challenge is more substantial. A great way around this is to join an organised tour or road trip. As well as having a ready made bunch of friends and ski buddies, these tours often begin (or can collect you from) international airports or transport hubs, so you can avoid expensive transfers and confusing/impractical public transport while still travelling around your chosen destination to see more sights and get a much deeper feel for it than you would by staying in one place. For the utmost adventure at the ends of the world these group tours are really the only affordable way to go. 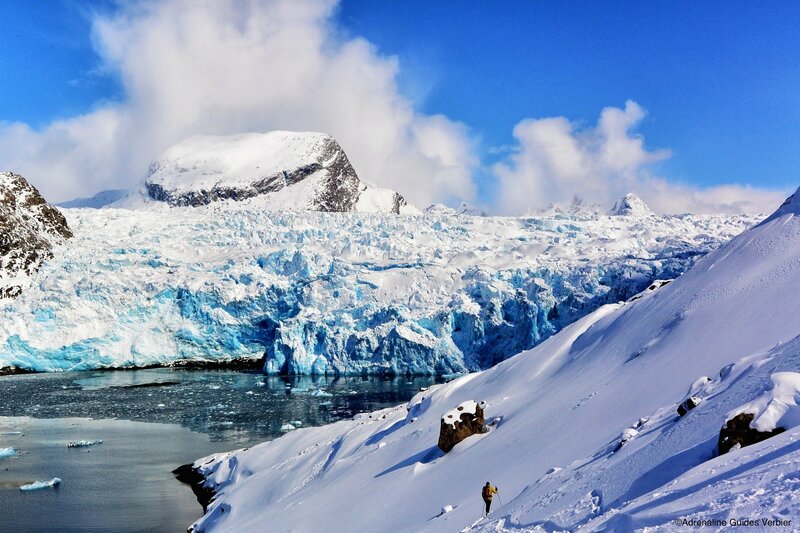 At the most extreme end, you can even use a ship as a base to go ski touring in Antarctica! Whether you want to improve your skills or just to ride the best secret lines in the given avalanche and snow conditions, by far the best option is to hire a qualified local guide or instructor. Unfortunately this can get very expensive, with guides fees often topping €400 per day! With no one to split the costs with as a solo traveller, this can make a HUGE difference to the total cost of your trip. One of the best ways around these costs is to join a dedicated freeride camp. There are many camps all around the world, for all ability levels from beginner to genuinely expert, almost athlete-level shredders. Camps often tie in guiding/instruction, accommodation and airport transfers, which keeps costs down, and are a great way to meet new, adventurous ski buddies (who may well be interested in joining your big trip next year)! Other than coaching camps, most heliski and cat ski operators are excellent at matching small groups, couples and singles into homogenous groups – keeping everyone happy and moving at the same speed and rhythm is essential to making the most of each day. You need to choose the operator carefully to match your ideal type of terrain, ski level, budget and preferred group size (larger helicopters normally work out cheaper, but can mean you cover less ground and ski less fresh snow), but they are normally able to coordinate transfers to manage costs, and the remote but sociable lodges are a perfect place to relax and meet new like-minded friends. 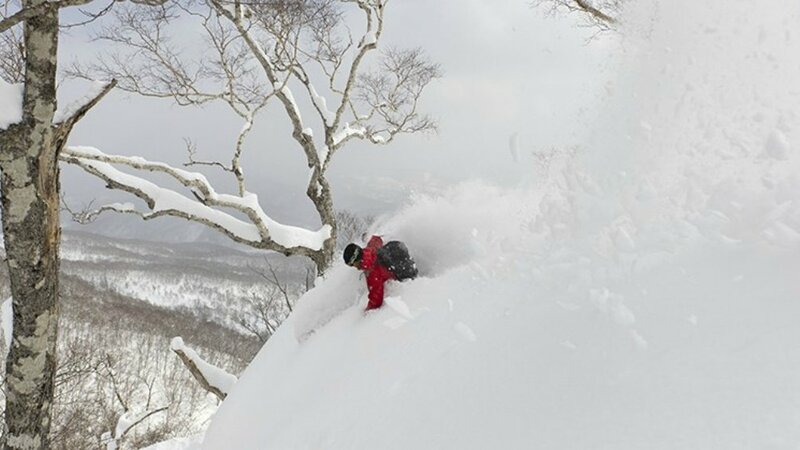 Black Diamond Lodge and Tours is the ultimate choice for true powder addicts and ski bums who want to experience the real Japan and its legendary powder! The lodge itself is not fancy, and rather quite basic and hostel-style, though full of charm. It’s a hub for an ecletic bunch of passionate riders from all over the world, and the atmosphere is extremely open, friendly and welcoming. They run a number of different tours and road trips around Hokkaido, which means you can chase storms around the island, exploring the best resorts in the best snow conditions. Trips generally finish either in Sapporo (a crazy city which is well worth a visit) from where you can fly home, or back at the Lodge in Niseko, so it’s easy to coordinate your onward travel plans. The Skiers Lodge in La Grave know what a 21st century skier really wants, and they deliver. Offering world class guiding in small groups, a strong and welcoming chemistry between lodge guests and guides, plus cozy boutique-style accommodation with gourmet food, Skiers Lodge La Grave has everything you could ask for. The Lodge is perfectly located, just 3 minutes walk from the lift, and next to the attached K2 Bar (often hosts live music) – the ideal place to meet new friends. 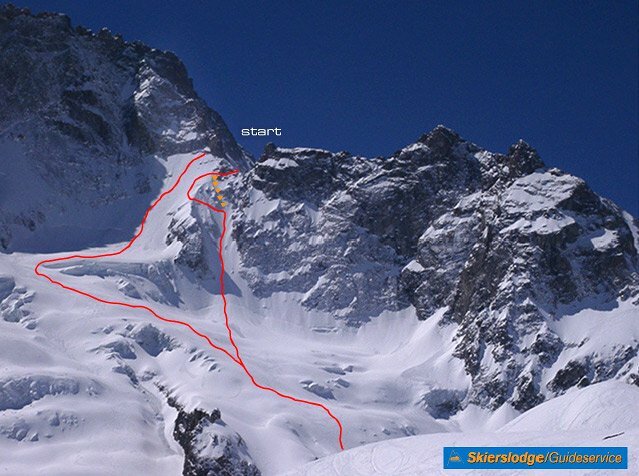 La Grave boasts the biggest lift-accessed backcountry in the world, with vertical descents of over 2000 vertical meters. The terrain features steep chutes, 50 degree pitches, cliffs, and crevasses. With all that said, this trip is not for the fainthearted: the steep slopes and dramatic drops mean this trip is for advanced and expert riders only. You don’t have to get too extreme, and many clients take it rather relaxed, but you should be ready to tackle full on high alpine terrain. Many heli operators provide a decent set up with cozy lodges, small groups, big terrain, and plenty of snow, but Northern Escape Heliskiing offers all of the above and at the very best quality. What really separates the wheat from the chaff is a well functioning and reliable team behind the scenes. The logistics behind a heliski operator are incredibly complicated – it’s a lot of effort to coordinate all skiers, pilots, helicopters, fuel, etc. If a team does not work well together you’ll notice a lot of waiting, slow skiing, time consuming arrival procedures and mistakes in the daily routine – not what you want on your trip! With Northern Escape and their well-trained team you get the best experience in all respects: the ‘machine’ is state-of-the-art and the guides among the best. Returning to the wooden log-style chalets is very special at Northern Escape. You´ll be treated to yummy tapas, with cold beer and wine, before relaxing with your new ski buddies in the hot tub. The lodging is a very important part of the whole experience, and the incredibly welcoming owners John and Jody (plus their daughter Mikaela) will make you feel truly at home. They definitely have a talent for creating a warm and joyful atmosphere: good times – with interesting people from all over the world! Plus, no down days at Northern Escape! When it snows too heavily for the helicopters to fly, the snowcats whisk you up the goods and more than your fair share of deep stormy powder. Immerse yourself in the wild and beautiful landscapes of Iceland on a one-of-a-kind sailing and skiing trip. In the Hornstandir Nature Reserve, in the West Fjords of Iceland (just a few miles from the Arctic Circle), you can leave the world behind, spending your days skiing the snowy peaks and your nights resting at sea on the ‘expedition yacht’ AURORA. On the Iceland Sailboat Skiing trip you’ll anchor each night in a different spot, traveling around the fjords finding the best powder. Each day you can look forward to 6 to 8 hours of skiing or snowboarding, but whenever you’re ready to rest, your boat will be waiting at the bottom of the hill. The boat sleeps 10 guests in comfortable bunks, and you’ll enjoy communal gourmet meals aboard with the rest the group. SASS Camps are located in the beautiful lakeside ski town of Bariloche. At these amazing, all-inclusive camps, you will have the time of your life perfecting your skills and enjoying the best of Argentina. SASS prides itself in offering the best of everything, from the coaches and guest pros, to the accommodation and hospitality. The wonderful Patagonian terrain you will ski or ride during your trip covers over 1,500 acres, including epic backcountry. You’ll be awestruck with the amazing vistas over snowcapped peaks and abundant lakes at the massive Cerro Catedral Resort – one of the best resorts in South America, with an incredible variety of terrain from steeps to trees. Young-minded riders will particularly love the SASS camps because you can shred as much as you want during the days, then enjoy Bariloche’s epic nightlife in the evenings. Riders come from all over the world to enjoy the company of other young people looking for the times of their lives. If you’re looking for the perfect accommodation for your solo ski holiday, the Cold Fusion Chalets in Chamonix is it! The Cold Fusion Chalets is a world leader in singles skiing and singles snowboarding holidays in the Alps. With an unbeatable location, a fresh modern design, and a focus on creating a fun, social atmosphere, the Cold Fusion Chalets are a great place to make friends, and meet new skiers and snowboarders from around the world. The Chalet accommodates a group of 27 solo skiers. The singles-only environment at Cold Fusion means you won’t find any families, groups or children at the resort, just other like-minded single travelers ready to meet, mingle and have a great time. Some of the special features of the Cold Fusion chalets include hot tubs and saunas, chefs, and chalet hosts and ski hosts to cater for the needs of all single skiers and snowboarders. The chalet also offers a resort transport by private minibus so you can be on the ski slopes in no time.